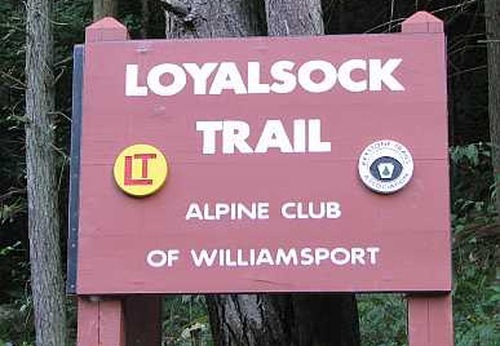 The Alpine Club of Williamsport, PA, organized in 1953, maintains the 59.21 mile Loyalsock Trail (LT) and has trail care hikes and other outings. Hike offerings and Spring Work Hikes will appear on the Activity Schedule page of this web site. Alpine Club membership is open to anyone over the age of 18. The Alpine Club invites you to hike the Loyalsock Trail in hopes that you will enjoy, explore, and protect the wild lands and places of natural beauty! Pennsylvania General Energy (PGE) is constructing a natural gas pipeline from its well pad on Allegheny Ridge (Little Bear area of Loyalsock State Forest) along portions of the Bryan Hay Trail and a small section of the Loyalsock Trail. The pipeline’s 50 foot wide clearing is directly adjacent to the LT for about 160 yards, from LT Miles 3.51 to 3.60 — that is, from where the LT takes the left fork where Bryan Hay Road meets old Smith Road, and to where LT turns left and leaves Bryan Hay Road (see LT Guide). Trail markers are located on the north side of the opening. Hikers should use caution when traversing this area and avoid construction equipment. The forest district is working with the Alpine Club of Williamsport and PGE to assess and resolve potential long-term impacts to this section of the trail, extending to mile marker 1.95, in totality rather than piecemeal as PGE’s operation moves forward. There have been a few changes we need to note, as a Corrections insert to the latest 19th Edition of our Guide. First, we are noting that our new website is now alpineclubofwilliamsport.com. Second, because of an evolving philosophy on Trail Registers, Loyalsock Forestry has taken ownership of Trail Register administration. Thus, many of the Registers have moved, and their locations in the 19th Edition of the Guide are not correct. Trail Registers are now at miles: 0.00, 4.85, 13.25, 22.13, 28.39, 41.94, 49.02, 59.06 and on the Link Trail at mile 5.50. Finally, on Map#2, the High Knob Road crossing label should say 29.95 mi. NO FIRES are permitted anywhere on the LT from March 1 to May 25, from October 1 to December 1, and at other times when the fire danger is posted as High, Very High or Extremely High. NO FIRES are permitted in the Haystacks Area at anytime. 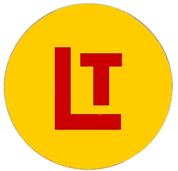 The LT is blazed with yellow disks having red LT letters in the center. Double blazes warn of an upcoming change in direction of the trail. Still visible are old 2″ X 6″ rectangular yellow paint blazes with a 1″ horizontal red stripe. Turns were marked with a yellow directional arrow. Learn how to purchase full Loyalsock Trail Guides with directions, maps, and additional info. It is recommended that you use the most current (19th) edition.